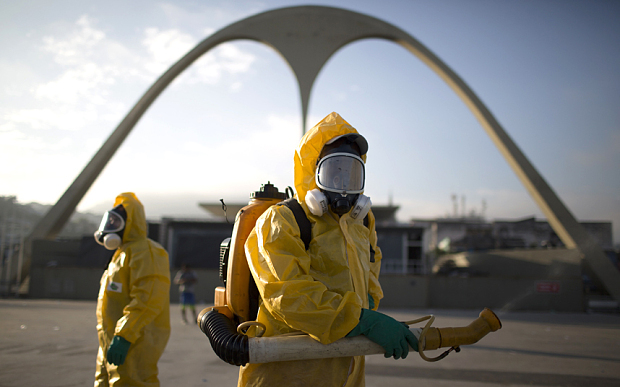 Concerns over the Zika virus reached new heights last Tuesday (Jan. 26) after Brazil sent fumigators into Rio de Janeiro’s world-famous carnival venue that will help host the Olympic games amid intensified efforts to control the mosquito-borne infection. 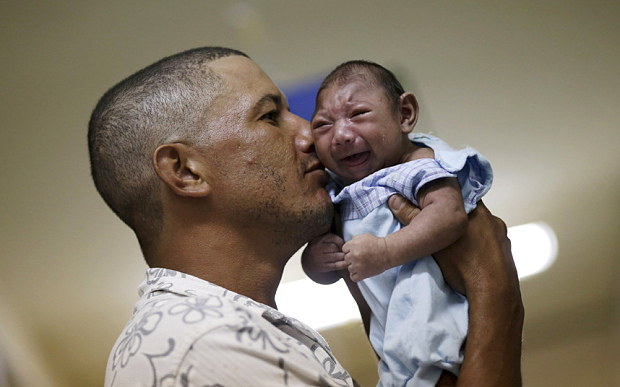 Workers in protective overalls and goggles sprayed the Sambadrome facility two weeks before it stages February’s carnival parades even as a senior official stoked further fears by suggesting that the war against Zika – thought to cause brain defects in new-born babies – was being lost. The 90,000-capacity Sambadrome…is one of Rio’s most iconic venues and will stage the archery events during this summer’s Olympic games. It became the unexpected focus of attention in the government’s public health campaign against Zika as Marcelo Castro, Brazil’s Minister of Health, said 220,000 troops would go door-to-door in an attempt to eradicate the virus before the carnival takes place on February 7 and 8. Mosquito repellent would be handed out to 400,000 women on social welfare, he said. Yet Mr. Castro appeared to undermine hopes of re-assuring the public by saying that the drive to combat the virus had come too late, prompting calls for him to be fired. The country was “badly losing the battle” against the Aedes aegypti mosquito that transmits Zika, as well as dengue, hikungunya and yellow fever, he told a crisis meeting in Brasilia, Brazil’s capital city. “The mosquito has been here in Brazil for three decades, and we are badly losing the battle against the mosquito,” he said in comments that were criticized as “fatalistic” by the Geneva-based World Health Organization. Zika, a virus first discovered in Uganda and previously more common in Africa and Asia, is suspected to be a cause of microcephaly, where babies are born with unusually small heads and brain abnormalities, although no definite link has been established. Nearly 4,000 cases microcephaly cases have been discovered in Brazil since last October, compared with 150 instances for the whole of 2014. Concern over the virus has spread, with outbreaks reported in several other Latin American countries and the Caribbean. Officials in Ecuador, Colombia and El Salvador have advised women to delay getting pregnant while America’s Centre For Disease Control and Prevention (CDC) recently cautioned pregnant women against travelling to 13 Latin American countries, as well as Puerto Rico, a United States territory, where Zika has been prevalent. 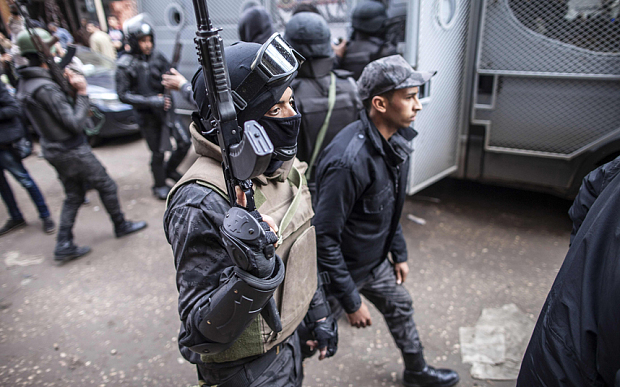 Five years after the revolution which overthrew his military predecessor, Egypt‘s President Abdel Fattah el-Sisi flooded the streets of Cairo with troops and police on Monday (Jan. 25) to prevent the anniversary being marked by repeat protests. But in practice Mr. Sisi showed he would allow no repeat protest or attempt to imitate events of 2011. A ministry of interior spokesman told a local newspaper that any attempts at “riots” would be met firmly by the police, to the extent of shooting live rounds. In his speech, on the eve of the anniversary, Mr. Sisi said he was trying to strike the “ideal balance between rights and freedoms.” “There should be a framework of responsible freedom that prevents it from turning into destructive chaos, which undermines the fundamentals of the state and the people’s resources,” he said. In the event, the center of Cairo was eerily silent, both protesters and to an extent ordinary passers-by and cars staying away. Most shops in Downtown were closed. The police combined with rainfall to give the streets of the Arab world’s most populous city a ghostly appearance – wet and empty, rather than thronged and dusty. The only sign of life in Tahrir Square itself was a small pro-police demonstration. A few score people waving Egyptian flags presented flowers to police, who reciprocated in public locations around the country. The Muslim Brotherhood had called for protests, but these were small and largely passed without incident, in locations away from the main centers of towns. 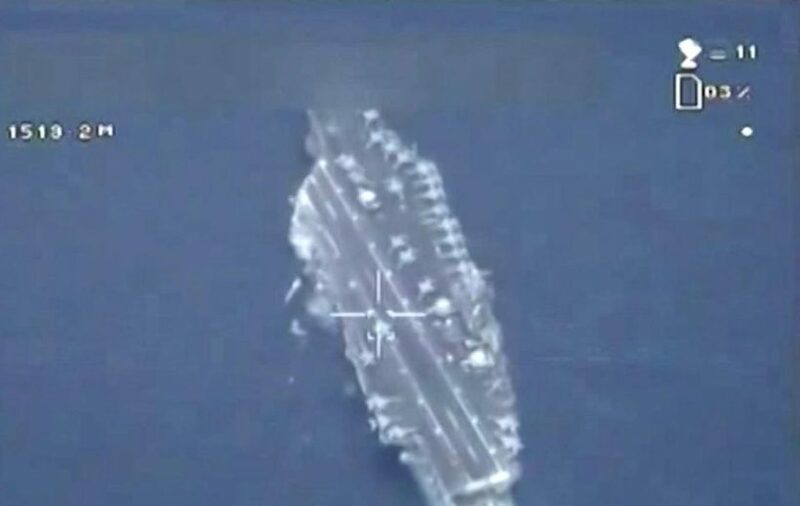 TEHRAN, Iran — Iran flew a surveillance drone over a U.S. aircraft carrier and published video of the encounter Friday, the latest in a series of edgy naval incidents between the two countries in the Persian Gulf after the recent nuclear deal. While the U.S. Navy stressed it knew the drone was unarmed and the flyover didn’t interrupt U.S. operations in the war against ISIS, the incident underlined the continued tension over control of waterways crucial to global oil supplies. It follows a rocket test last month by the Islamic Republic near coalition warships and commercial traffic, as well as Iran’s brief capture of American sailors who strayed into its territorial waters. Iranian state television and the semi-official Fars news agency of Iran, which has close ties to the Revolutionary Guard, published identical images Friday both said came from the drone. The footage, which The Associated Press could not independently verify, purported to show the drone being launched and then hovering over an unidentified aircraft carrier, a targeting bracket briefly passing over a jet parked on the deck below. The Iranian reports suggested the footage was from Friday. However, Cmdr. Kevin Stephens, a spokesman for the U.S. Navy’s 5th Fleet based in Bahrain, said an unarmed Iranian drone flew near the French aircraft carrier Charles de Gaulle and “directly over” the USS Harry S. Truman on Jan. 12 as the vessels were in international waters in the Persian Gulf. He said the Navy launched a helicopter that determined the drone wasn’t armed and “posed no danger to the ship” as the carrier wasn’t conducting flight operations at the time. His comments implied that had there been active takeoffs and landings of U.S. aircraft, the situation might have changed. The nuclear-powered USS Harry S. Truman, based out of Norfolk, Virginia, is in the Persian Gulf region launching airstrikes and supporting operations against the Islamic State group (ISIS) in Iraq and Syria. 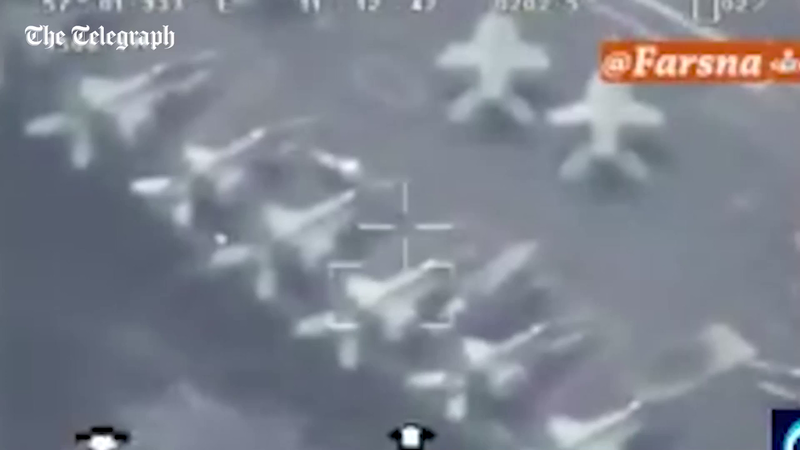 Adm. Habibollah Sayyari, the commander of Iran’s navy, called the drone overflight “a sign of bravery.” It “allowed our men to go so close to the warship and shoot such a beautiful and accurate footage of the combat units of the foreign forces,” he told state television. State television and the state-run IRNA news agency said an Iranian light submarine also participated in the surveillance operation. When asked about the presence of a submarine, Stephens said: “Iran has several submarines … for its current exercise,” but declined to discuss specifics. In Washington, U.S. Navy spokesman Cmdr. William Marks stressed America remains ready to use force if necessary. “We are confident in our force’s ability to respond appropriately as the situation dictates and will defend ourselves should that prove necessary,” he said. Iran’s navy began a naval drill this week over a 1.16-million-square-mile area including parts of the Strait of Hormuz, the Gulf of Oman and the Indian Ocean. Iran said Wednesday its navy warned a U.S. warship to leave an area of the naval drill. The U.S. Navy later denied its operations were affected. Meanwhile, in recent months, Iran has shown footage of underground missile bases on state television and conducted ballistic missile tests criticized by the U.S.
b) What condition is the Zika virus believed to cause (though no conclusive link has been found)? c) What steps is the Brazilian government taking to eradicate the Zika virus? d) What do you think about the Health Minister’s statements and the government’s attempts to combat it now? b) CHALLENGE: Read the commentary “Some Rare Good News from the Middle East” by Michael Mukasey, U.S. Attorney General from 2007-2009. Contrast this view of President al Sisi with that of the news brief here, or any other news report on al Sisi. Why do you think they are different? b) What was the problem with Iran’s drone flight over the USS Harry Truman aircraft carrier if it posed no actual danger to the ship? c) Ask a parent: Considering Iran’s treatment of U.S. sailors and its aggressive talk and actions against our military, how do you think the next president should deal with Iran: continue Obama administration policies, or take a stronger tactic? Explain your answer. 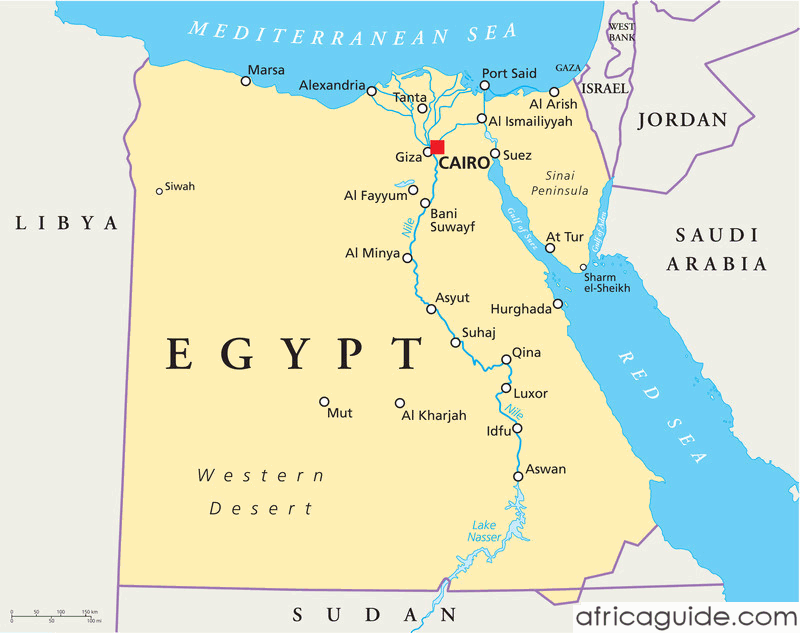 The 2011 Egyptian revolution began with protests marking January 25, which is officially designated “Police Day” in Egypt. With new demonstrations called for January 28, the Friday of that week in 2011, the Muslim Brotherhood crucially decided to lend its weight to the protest movement. In dramatic day-long battles, which led to the deaths of hundreds of people, protesters seized Tahrir Square and other key sites in Cairo and elsewhere, and the police were withdrawn from the streets. Long-time ruler, President Hosni Mubarak, was forced to resign on February 11. Following an interim period of some chaos, the Muslim Brotherhood came to power in a series of parliamentary and presidential votes, before being ousted by Mr. Sisi, who had been appointed defense minister by President Morsi in July 2013. 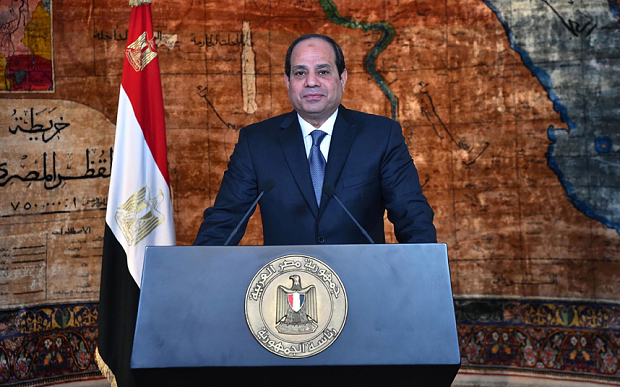 In his speech on the eve of the anniversary, Mr. Sisi said the original revolution had been deflected for “personal gains and narrow interests” – a reference to the Brotherhood, which has been decimated since the coup, with many of its leaders now on death row. 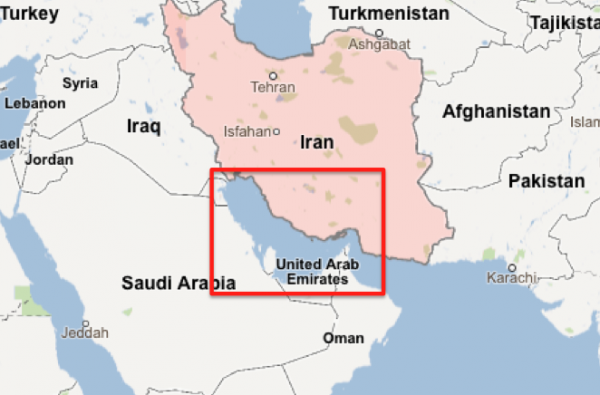 Iran has more than 1,240 miles of shoreline facing the Persian Gulf and the Sea of Oman. Control of that territory, including the Strait of Hormuz, through which nearly a third of all oil traded by sea passes, has remained a priority for Iran’s military and it conducts regular drills in the region. The U.S. has criticized some of those maneuvers, including what it called a “highly provocative” Iranian rocket test in December near U.S. warships and commercial traffic passing through the strait. Iran denied the test was provocative. The U.S. later released footage showing the rocket fire. Also, Reuters reports: Iran’s supreme leader has awarded medals to Iranian navy commanders for capturing U.S. sailors.